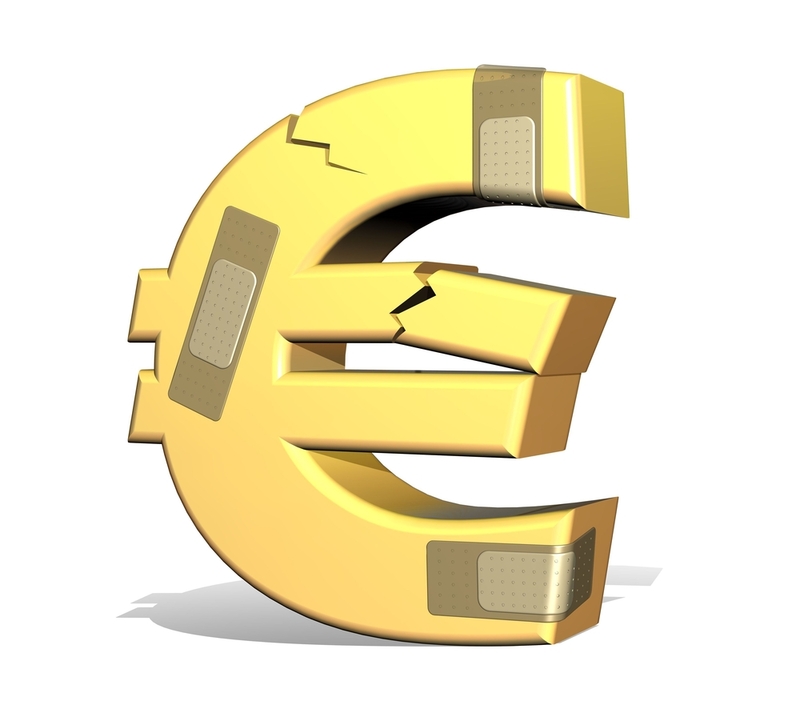 Will ECB Send Euro to 1.20? Will the ECB Send EURO to 1.20? Investors continued to buy U.S. dollars, sending the greenback to fresh multi-month highs against many of the major currencies. 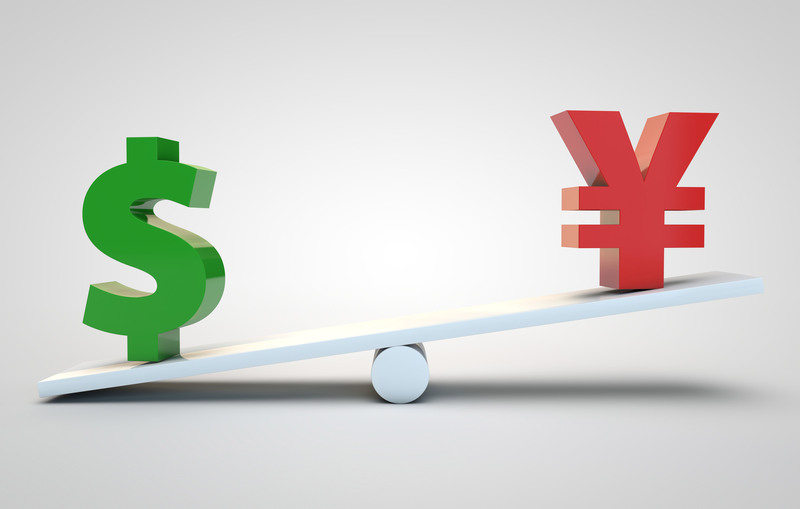 USD/JPY is trading at its strongest level in 2 months, the New Zealand dollar is at its weakest in 3 months and the Australian dollar has fallen to its lowest level in 4 months. With ten-year Treasury rates breaking 3%, yield spreads are shrinking quickly and after a year of divergence, interest rates and currencies have finally recoupled. We expect this trend to continue as other central banks plan to keep their monetary policies easy. 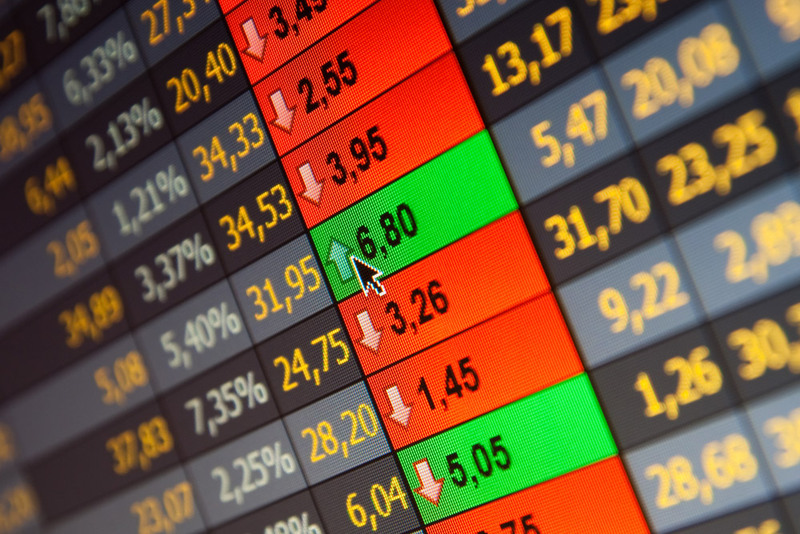 No U.S. economic reports were released on Wednesday and Thursday’s reports on jobless claims, trade balance and durable goods orders aren’t expected to have a significant impact on the currency. Instead, yields, equities and the European Central Bank’s monetary policy meeting will be the main focus of the day. Euro is trading sharply lower ahead of the European Central Bank’s monetary policy announcement. The ECB meeting is the most important event risk this week and while no policy changes are expected, the euro is bound to move on the back of Mario Draghi’s comments. Over the past 6 weeks there’s been widespread deterioration in business activity prompting investors to position for a dovish outlook. Even Germany’s Bundesbank head said recent indications for Germany in the first quarter were “not so brilliant.” However we can’t assume overwhelming dovishness from Draghi because last Friday he also said their confidence in the inflation outlook increased as the growth momentum is expected to continue. Taking a look at the table below, inflation has been on the rise, labor market conditions improved and equities stabilized in April. So underneath the weakness there are positive developments. 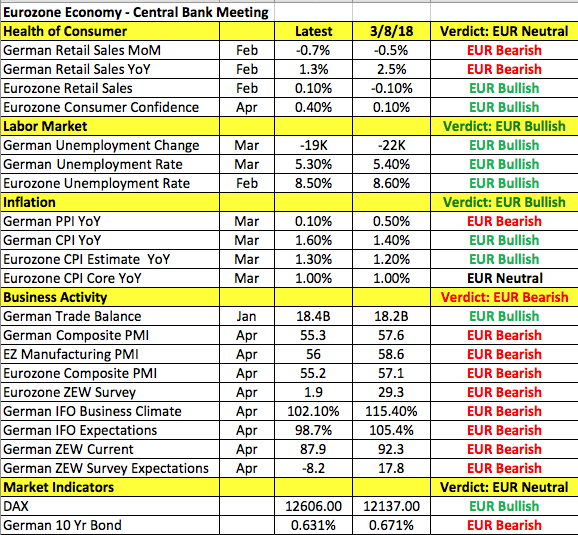 In fact, when the ECB last met in March, they removed a line in their policy statement that referenced the possibility of increasing stimulus but euro tanked because Draghi emphasized the downside risks, strong, protectionist threats and the need for policy accommodation. The question for Thursday is whether these threats overshadow the uptick in inflation and positive growth momentum. We know that the ECB is not ready to raise interest rates and they certainly don’t want to see EUR/USD back above 1.24 because that would offset the improvements in prices. Yet they also want to end QE purchases this year – so Mario Draghi has quite the balancing act to do on Thursday. We think Draghi will remain cautious and emphasize patience, which in an environment of a rising U.S. dollar could send EUR/USD down to 1.21 and eventually 1.20. However if the tone of his press conference is a bit more optimistic, EUR/USD could bounce back up to 1.23. 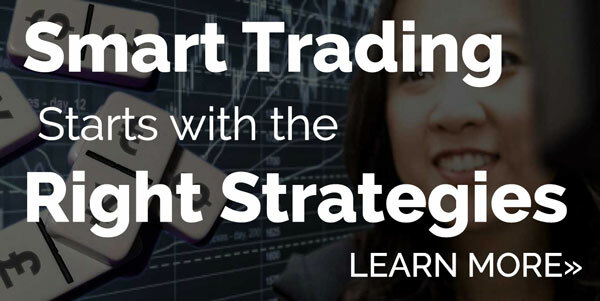 After rebounding for the first time in 6 trading days, traders returned to selling sterling. However unlike some other major currencies, today’s move did not take GBP/USD below any support levels. For the time being losses are still limited to 1.3900 but with the pair below the 50-day SMA and the downtrend firmly intact, it may only be a matter of time before we see further weakness. With no UK data released today and nothing significant on the calendar tomorrow, EUR/GBP flows will most likely drive sterling the next 24 hours. Brexit will also be in focus as there’s a big customs union debate and vote in the Parliament’s lower house on Thursday. Prime Minister May was dealt her third defeat in less than week in the Upper House over her Brexit plans. Although the Lower House could overturn these decisions, they highlight the ongoing resistance to May’s Brexit strategy and raises the odds of a soft Brexit. The currency hit the hardest by the rising dollar continues to be NZD. Not only was it the day’s worst performer but today’s slide marks the seventh consecutive day of weakness for NZD/USD. This is the longest stretch of losses for the pair in more than a year and the move is driven entirely by a shrinking yield spread. The spread between 10 year New Zealand and U.S. bond yields have fallen to their lowest level since January 2000 and it may be longer than that as our data only goes back that far. There’s support at .7050 but it may only be a matter of time before 70 cents is tested. 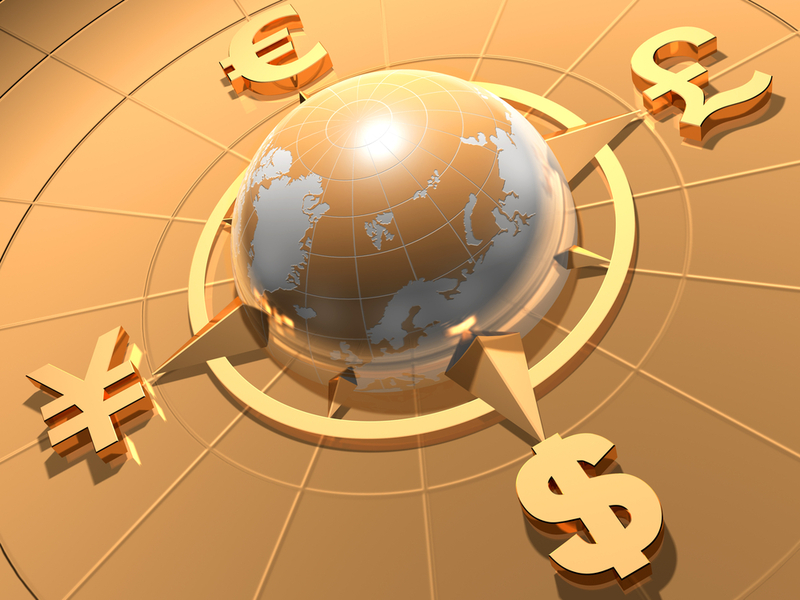 The same dynamics are driving AUD/USD, which fell to a 4 month low – support is at 75 cents. 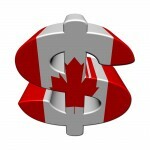 Of the commodity currencies the Canadian dollar is the most resistant to gains with USD/CAD backing off 1.29. Steady oil prices, rising Canadian bond yield spreads and the prospect of a NAFTA deal have limited the slide in the loonie. Draghi has trapped himself. He cannot end the QE because ECB owns over 40% of EZ gov debt. If they do not repurchase and make new purchases of zero rate gov bonds from Southern Europe, then these economies will go belly up with too much interest rate costs. He can talk whatever he wants, but he cannot taper. Draghi is cornered! This is while the USD denominated debt in Asia has reached very high levels compared to the respective GDP. Even China has 300% debt-to-GDP, it is right 300%!! !